Gluten-free vegan raspberry rhubarb glazed donuts have a deliciously moist vanilla crumb and are dipped in a tangy and sweet rhubarb raspberry glaze! What more could you want for National Donut Day? Today is all about the donuts. That’s right. It’s National Donut Day. As such an important national holiday to our culture, I figured I needed a donut. First off, do you know how hard it is to find a gluten-free vegan donut in Chicago? Apparently, very difficult. Every donut place under the sun has a gluten-free donut and also a vegan variety. But are they ever combined together? Nope. This legit became a large research project this week involving many people (thanks for still talking to me after that) and emails to donut shops inquiring about their donut selection for this fine day. I told you it was serious stuff. To my delight, I did find two gluten-free bakeries that had vegan donuts in my research. However, to my dismay, they are only open from the hours of 10-3 and 12-5, respectively. Doesn’t really help a girl out who works in the suburbs and can’t get back to the city before 6pm. So here’s what I learned in this journey. Either (a) Chicago needs more gluten-free vegan donut options that I can grab in the morning before work. OR (b) I’ll just have to keep making my own donuts. These gluten-free vegan raspberry rhubarb glazed donuts were definitely a hit in my house. And by my house, I mean my belly. I had originally planned on making lemon donuts but a trip to the store to buy lemons was needed and after a draining two hour commute home I just couldn’t get myself to do it. Luckily, I had bought some gorgeous rhubarb from the farmer’s market the previous week and had frozen the extra for baking adventures like this one. Adding a little raspberry for color and flavor, alas the rhubarb raspberry glaze was born. I tweaked my normal donut recipe to make it vanilla flavored and splurged a bit with using powdered sugar in the glaze. You know me, refined sugar usually isn’t my thing but I was just dying to have a normal donut glaze for once. Also, if you are a true vegan, make sure your powdered sugar is vegan as well! I’m not vegan but just need my treats to be dairy-free and egg-free so I used normal powdered sugar. These gluten-free vegan raspberry rhubarb glazed donuts are cakey yet pillowy, tangy yet sweet, and so so moist. That’s why it’s my favorite donut recipe! If you’re not feeling the raspberry rhubarb glaze (though you should because it’s gorgeous and to die for) you can easily substitute any berries you have on hand and follow the recipe as is. Or you can use my refined sugar free chocolate frosting I used on these chocolate coconut donuts! All are great options! Now tell me, are you celebrating National Donut Day? 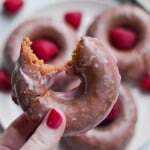 Learn to make these gluten-free vegan raspberry rhubarb glazed donuts with this easy recipe. Donuts are on the table in under an hour, making them great for brunch entertaining! Gluten-free, dairy-free and vegan. Preheat oven to 375F. In a large bowl, mix together flours, coconut sugar, baking powder, baking soda and salt.. Then, add in vanilla, apple cider vinegar, 3/4 cup almond milk and vegetable oil. Whisk until smooth. If the batter is still too thick add the additional 2 tbsp of almond milk. The batter should be thick but not as thick as cookie dough. Coat a donut pan with nonstick cooking spray (make sure it does not have flour in it if you need to be gluten-free). Spoon or pipe batter into the donut pan. The batter should just about reach the top of the pan and will make 6 donuts using <a href="http://amzn.to/1r5r16m">this pan</a>. Bake at 375F for 10-14 minutes or until the donuts spring back when you touch them. Cool on a wire rack. To make the glaze, add the rhubarb, raspberries and water to a small pot over medium heat. Cook for 5-10 minutes, until the rhubarb and berries are soft. Gently mash the rhubarb and raspberries. Then strain them into a bowl, discarding the pulp. Measure out 1/4 cup of the raspberry rhubarb juice. Mix it with the powdered sugar. You want your glaze to be thick and pink. Not red-pink. But pink. The glaze will thin out a lot when its on the donut. Adjust the glaze by adding raspberry rhubarb juice or more powdered sugar accordingly. Dip the donuts into the glaze and place on a wire rack to set. Donuts are best eaten on the same day or the glaze may melt and make the donut soggy. *Don't worry too much about the exactness of the rhubarb measurements - you'll be measuring out only 1/4 a cup and any kind of ratio of rhubarb and raspberry will be delicious so don't fret! Thanks for the recipe. I loved the donuts. The glaze reminded me a lot of bazooka “cotton candy” bubble gum. Is there an alternative oil that can be substituted for vegetable oil?? Hi Nicole! Melted butter, dairy-free butter or coconut oil would all work!